Tribune Chronicle / John Vargo Jackson-Milton's Michaelina Terranova, right, drives on Springfield's Haley LaMorticella Monday at Springfield. NEW MIDDLETOWN — Jackson-Milton began the season as a new-look team, one that made last season’s Division IV regional final at Massillon Perry. A couple of main scorers graduated, but this Blue Jays team might be better off this season. On Monday, they took a step to figure out how they might fare in the 2017-18 campaign. 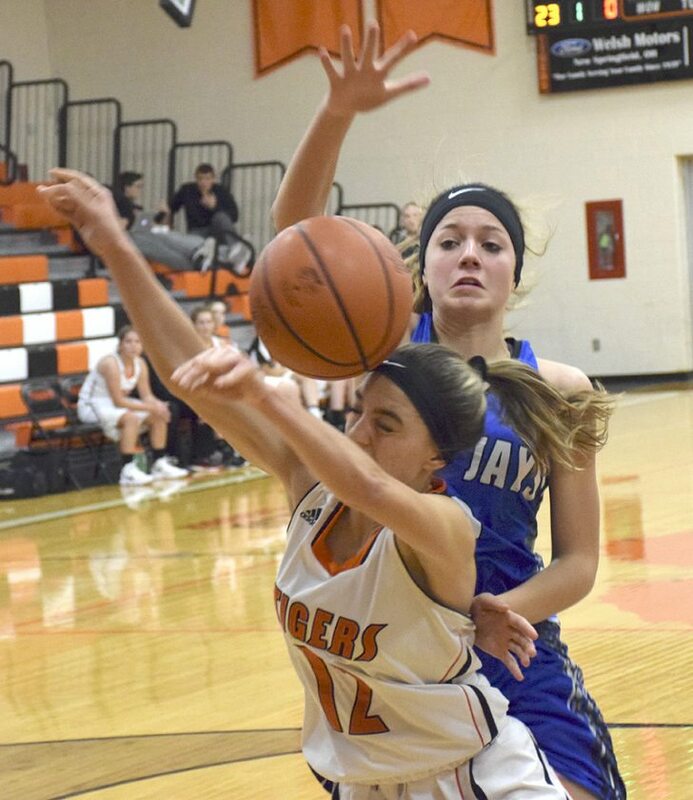 The Blue Jays girls basketball team realized it was a more cohesive unit. 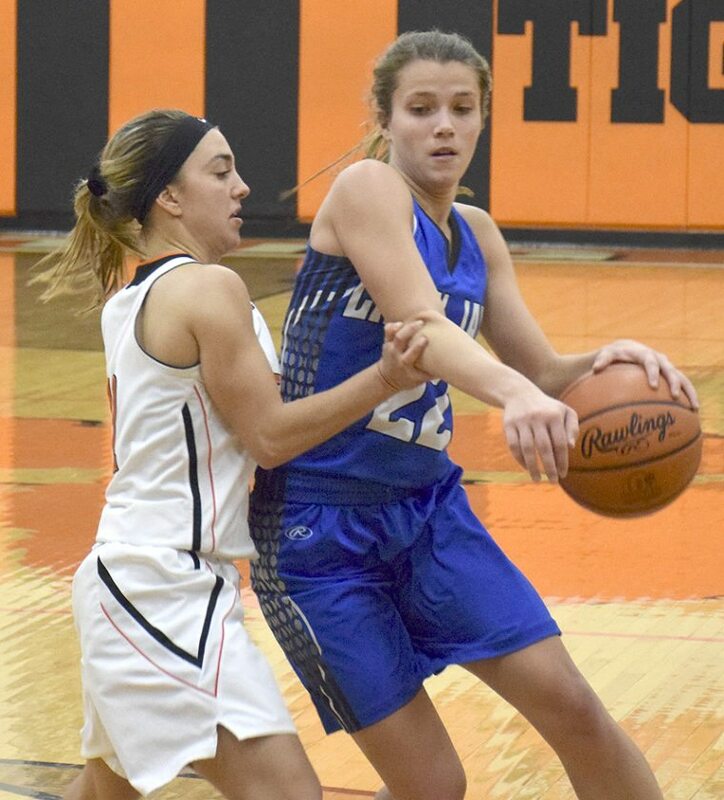 It was one that held off a feisty Springfield team in this Mahoning Valley Athletic Conference opener for both teams, 46-42. Tribune Chronicle / John Vargo Springfield's Mattisyn Gebhardt, left, and Haley LaMorticella, center, provide pressure as Jackson-Milton's Haley Lengyel loses possession during the second half of Monday's game in New Middletown. Jackson-Milton (3-0, 1-0 MVAC) rallied from an early 9-2 deficit to take a 15-9 lead after one quarter. 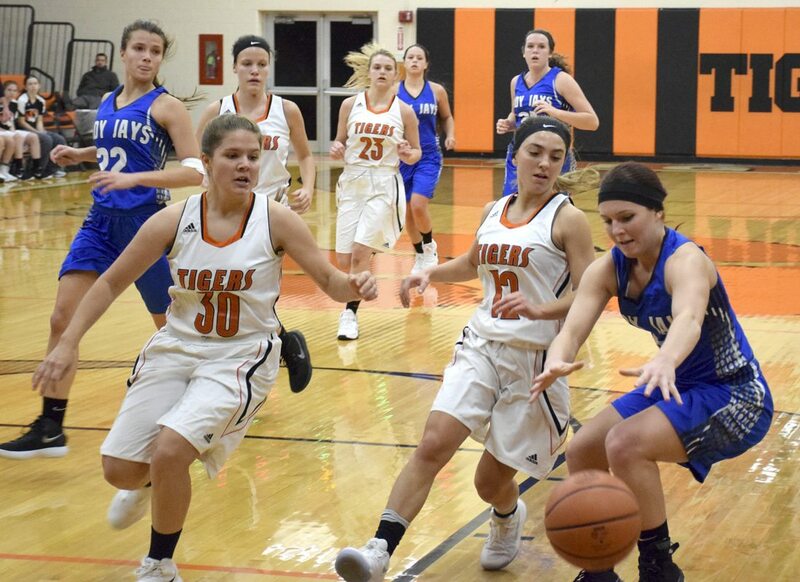 The Blue Jays held off Springfield (0-2, 0-1) up until the fourth quarter when the Tigers had back-to-back 3-pointers from Haley LaMorticella to close the gap to six, 37-31. Then Ellie Centofanti hit a 3 with 2:30 remaining to tie the game at 40. “Our kids got in the game and in the moment and just kept playing,” Springfield coach James Schuler said. Michaelina Terranova, who tied Ashley Cameron with 13 points for the Blue Jays, made one of two from the foul line with 1:28 remaining for a 43-40 lead. LaMorticella, who defended and hampered Terranova most of the night, drove and cut the Jackson-Milton lead to 43-42 with 1:09 left. LaMorticella had 11 points, while Marlie Applegarth had a game-high 14 for Springfield. Tribune Chronicle / John Vargo Jackson-Milton's Courtney Mercer, behind, tries to grab the ball away from Springfield's Haley LaMorticella during Monday's game in New Middletown. Emily Williams and Cameron combined for three of four from the line to seal the victory. Williams had 12 points, while Cameron added 12 rebounds. However, Springfield had some late turnovers in the fourth quarter — 22 in the game. The Blue Jays had their miscues as well, 26 in all. It’s something Jackson-Milton needs to correct going forward. They need to relieve double teams as the ones Terranova faced Monday. Keney said Terranova is an unselfish player and she said her team has been a cohesive unit, more than they were last season. Terranova said her team plays off of each others movements. Going forward, there’s only one thing to do for Jackson-Milton. “Just work together as a team,” Terranova said.